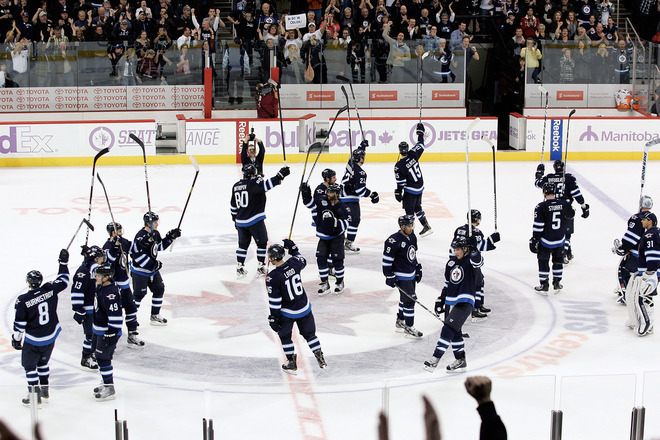 Before the season, most hockey pundits targeted the fact that the ex-Atlanta Thrashers/now Winnipeg Jets could not score. Maybe they have overcome that. Maybe they have overcome that in the biggest way possible. Not only did the Jets rally after a poor start on Saturday night, they made sure there wasn't a rally for the opposing offense. If there is any complaints about the Jets not scoring this season, they may want to look at how the Jets play with a lead. So far this season, the Jets have jumped out to the lead in five of their first seven games. Out of those five games they have led early, they have only been able to win two. Saturday night, they made sure that a Carolina team sans Cam Ward in net didn't make it back. Sure, critics may say that the Jets weren't playing a Hurricanes team at the top of their game, especially without their starting goalie, who is one of the best. But the fact of the matter is - they executed when they needed to. And they got the win when they needed to as well, beating a Carolina team that decided to play Brian Boucher instead of Ward. And, finally, and most importantly, for the first time in Winnipeg and the first time since March 27th of last season, the team scored five goals. There wasn't any turbulence at the hangar last night and the Jets hope there isn't any turbulence Monday night as Henrik Lundqvist and the New York Rangers visit MTS Centre.